Fire doors are installed to stop the spread of fire within buildings, however, fire doors can only fulfil this vital role, if they are closed when the fire starts. To this purpose fire doors are equipped with fire door closers, which close the door after a person passed through the door. However, it is not always practical to have your fire doors closed at all times as this can hamper the movement of people and equipment around your premises. 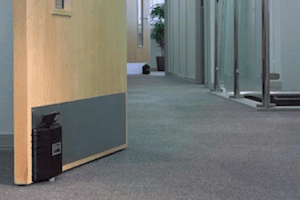 Corridors experiencing high footfall are especially likely to need a means of allowing fire doors to be held open to enable people to pass through or for air to circulate. It is therefore all too common to see a fire door wedged open, preventing the fire door from doing its job in the event of a fire. This is not just dangerous, it is also illegal and can lead to large fines. These days, there are devices available that allow fire doors to be held open legally. Fire door retainers hold the doors in the open position (against the pressure from the door closer) and release the door in the case of a fire, allowing the door closer to shut the door. Free-swing fire door closers, a further alternative, allow fire doors to be used like ordinary doors but will turn into a door closer the moment the fire alarm is triggered. Before the relatively recent introduction of retrofittable door retainers and free-swing door closers, the classic solution to holding open fire doors involved an electrically powered magnet fitted to the floor or wall and a steel keeper plate on the door. The magnet holds onto the keeper plate in the fire door’s open position. 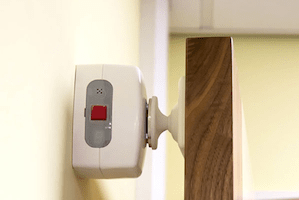 The magnet is wired to and powered by the fire alarm panel and is automatically switched off in case of fire, releasing the fire door and allowing it to close. 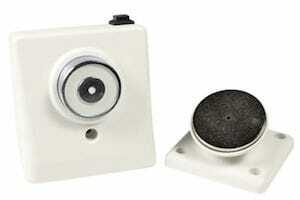 The magnetic fire door retainers can also be manually released via a push button. An example of this type of door holder is the Doormouse Fire Door Holder. The main advantage of this type of system is the low purchase cost of the equipment and the fact that no batteries have to be replaced regularly. However, installation costs are high, restricting traditional magnetic fire door retainers to new buildings rather than retrofit situations. They can also only be used in buildings with fire alarm panels. A further disadvantage is that the fire door can only be held in the fully open position. No partial opening is possible. Pioneered by the manufacturer Fireco, acoustic fire door retainers such as the Dorgard replicate the simplicity of a door wedge, but do so by deploying a plunger down onto the floor that is automatically retracted in case of fire. This plunger is pushed down with your foot but will retract when the Dorgard ‘hears’ the sound of a fire alarm, thus allowing the door to close with the aid of the already installed door closer. The battery operated Dorgard allows fire doors to be held open in any position and can be installed in 10 minutes. Fireco has now introduced an updated version that is suitable for noisier environments and has an extended three year battery life. The Dorgard SmartSound is able to better differentiate between the fire alarm sound and for example screaming children or cleaning machines. A similar product is the Agrippa Fire Door Retainer, which, however, combines the acoustic sensor with a magnetic retainer. As usual for magnetic retainers, the magnet is fitted on the wall or floor with a steel keeper plate fitted to the door. Like the Dorgard, this product is battery powered, making installation and maintenance simple. It also has the ability to tune in to the specific sound of your fire alarm signal, making this a good option for premises with high levels of background noise that could otherwise trigger the release of a standard acoustically activated door retainer. Acoustically activated fire door retainers are a good choice for retrofitting as they are simple to install and do not require wiring. The Agrippa door retainer will only hold the fire door open in the fully open position, though. The third option and a premium choice is a device that combines the functionality of a door closer and a door retainer into one product. 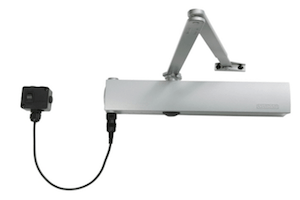 Battery powered and acoustically triggered free-swing door closers such as the Freedor or the Agrippa Free-Swing Door Closer enable the door to be left open at any angle and without any plunger or other holder. Importantly, they also effectively remove the ‘weight’ of a fire door by taking away the resistance usually imparted by the door closer. The door closing mechanism remains in an inactive state as standard, and will only activate upon ‘hearing’ the fire alarm. This allows the door to swing freely (hence the name) on a day-to-day basis, but still provides an effective barrier against fire when needed. The resistance-free opening makes free-swing systems a good choice when easy accessibility is required for disabled or infirm people – with a prime example being care homes, where residents commonly struggle to open fire doors against the pressure of normal fire door closers. 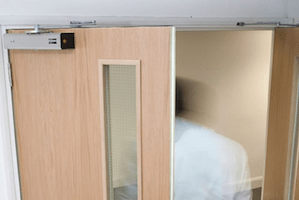 Again, there are also free-swing door closers available that are connected to and powered by a fire alarm system, although the connection to an alarm panel makes this option expensive to install. Fire doors are a crucial defence against the spread of fire. They are designed to contain a blaze for long enough so that the occupants of a building can escape safely, whilst also limiting the damage caused by the fire. However, these crucial barriers can only do their job if they are closed when a fire occurs. Thankfully, as we have seen, the solution to this problem is simple. When you install a certified fire door retainer or free-swing door closer, you gain the ability to leave your doors in an open position, confident in the knowledge that should a fire break out, they will close the door to restore the required fire barrier. A single, well maintained fire door can be the difference between a fire causing localised damage to a single room, or an entire property being engulfed in flames. Make sure your fire doors are closed when they are needed by installing an appropriate fire door retainer or free-swing door closer. Safelincs is the only company we recommend for all your fire safety products and services.